- Fiberglass model inside, solid wood legs, leather, pu or cashmere fabric. Inspired by snow formations,The inspiration chair for FROST; emerged from FurnID’s fascination with the lines and forms, which occur when the wind plays with new fallen snow. 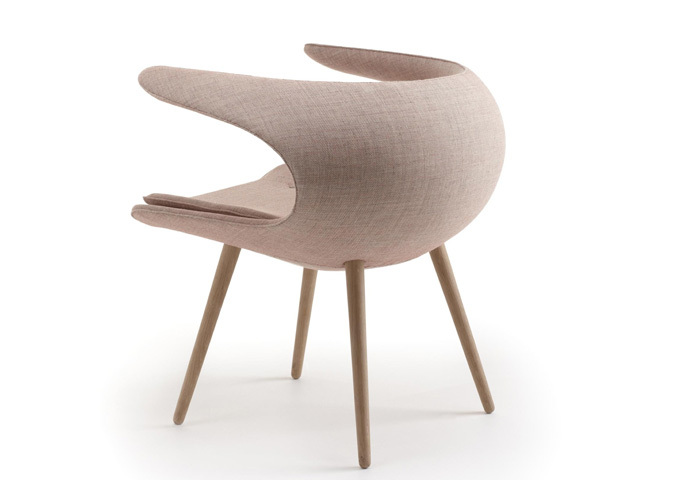 - In the same way the sculptural chair has the formal qualities of a snowdrift’s beautiful organic form, which covers the snow dressed landscape. - Designer Bo Strange explains “It has taken us nearly two years to develop FROST and during the process we there were many challenging discussions. It was a difficult task to keep the beautiful curves of the chair without destroying its comfort and light construction and we did not want to compromise either design or functionality. Since great comfort is a key issue for STOUBY, it took great deal of time to put everything in place”. - The attention to detail is evident and the effort to refine this has paid off when ones eye travels across the sculptural form. The organic form gives FROST a futuristic appearance, where all lines merges together, regardless of the angle from which the chair is viewed.